WHILE Ajax’s stunning victory against Real Madrid was a major upset, it was also a welcome reminder that unpredictability, if you scratch the surface deep enough, can still be found in modern football. The romantics would love to see Ajax rekindle the fires of European Cups past – let’s not forget Amsterdam’s finest have won the competition more times than Manchester United, Juventus and Inter Milan. But since the days when Cruyff and co. stood astride the European game, the dynamics have changed – substantially. Ajax, despite their status in the Netherlands, are no longer among the continent’s elite. While Ajax confounded the odds by beating Real Madrid, repeating the trick against a Juventus team that overturned a two-goal first leg deficit in the round of 16 could prove to be tougher. For a start, Real are in club going through transition – Zinedine Zidane is their third coach this season. Their team has gone beyond its peak and in need of refurbishment. Ajax are young and vibrant, but they will be up against Cristiano Ronaldo, the man who won the round of 16 tie for Juve with a hat-trick, and a player on a mission to have one final hurrah in the competition. Ajax, like every giant-killer, may have had their moment. Juventus are poised to secure their seventh consecutive Serie A title. They’ve lost just one league game, the recent defeat at the hands of Genoa. Despite this setback, Juve are 15 points ahead of second-placed Napoli with 10 games to go. Cristiano Ronaldo has scored 19 of their 59 Serie A goals this season. Ajax are in second place in the Eredivisie, five points behind leaders PSV Eindhoven with eight games remaining. The two teams meet in Amsterdam on March 31, a game that could put pressure on PSV if Ajax win. Ajax are unbeaten at home in the league but PSV have lost just once, an away loss at Feyenoord. Ajax are already in the KNVB Cup final, where they will meet Willem II on May 5 in Rotterdam.There’s no doubting their goal power, they’ve scored 88 goals in 26 Eredivisie games with Dušan Tadić leading the way with 19. In the UEFA Champions League, Juventus topped a group that included Manchester United, Valencia and Young Boys, Berne. They won four of their six games and followed that up with a 3-2 aggregate win against Atlético Madrid. Ajax had a tough path in the competition, coming through three qualifying rounds, beating Sturm Graz, Standard Liège and Dynamo Kyiv. Their group was also daunting, including old foes Bayern Munich and Benfica and Greece’s AEK Athens. In the round of 16, a 1-2 home defeat in the first leg against Real Madrid looked to have put paid to any hopes of progress, but that 4-1 win in Spain gave them a memorable victory. Juventus rank among the top dozen clubs in Europe in terms of financial strength. The Turin club generated € 395 million in 2017-18 compared to the € 92 million earned by Ajax during the same period. This underlines the relative weakness of the Dutch Eredivisie compared to Serie A and the other major leagues. Juventus’s squad, according to TransferMarkt, is worth around €750 million, while the Ajax squad is valued around € 450 million. In 2017-18, Ajax’s wage bill was approximately € 47 million, less than half the total paid out by Juventus. With Cristiano Ronaldo now at Juve, the wage bill has surely gone even higher. CR7 is earning € 31 million a season, according to media reports. Ajax draw over 53,000 to their home games at the Johan Cruyff arena, bigger crowds than during the club’s early-1970s heyday. This is 13,000 more than Juventus’s home gates at their excellent new stadium. But matchdays are only part of the story today. Although Ajax is clearly a global name, the most exportable of the Netherlands’ football clubs, Juventus have been far more successful in harnessing social media.Juventus’s total followers across Facebook, Twitter and Instagram number 68 million versus the Ajax combined total of just under five million. Ajax have made big strides in broadening the club’s global footprint. In November 2018, Ajax opened an office in New York, recognising that the US is a growing market for European football. The club has also entered into partnerships with clubs in China, Japan and Australia over the past year. Juventus have also identified the US and China for expansion. This is based on the view that Italy has reached its maturity as a football market and future growth is limited. Juve’s research suggests that the club could gain as many as 27 million fans in the US. Both Ajax and Juventus are pre-eminent in their domestic football landscapes. They’ve won 33 and 34 league titles respectively. 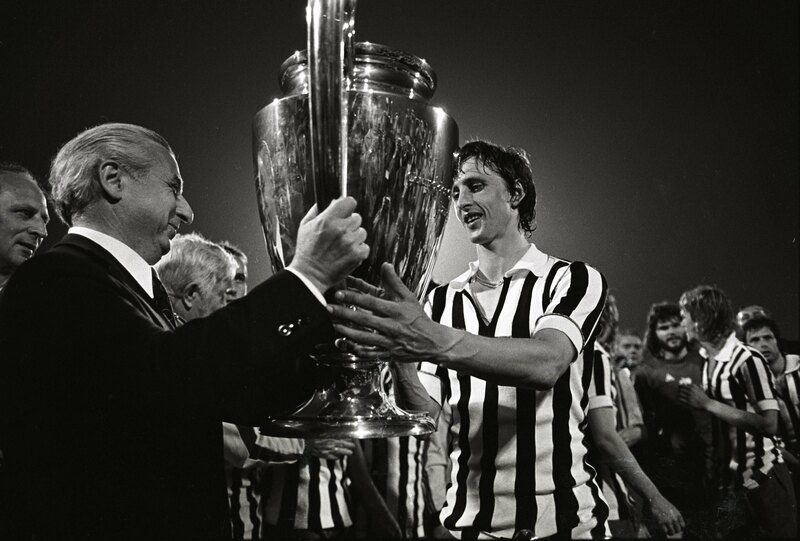 Similarly, Ajax have won the Dutch cup 18 times versus Juventus’s 13. In Europe, both clubs are in an exclusive band who have won all three of UEFA’s principal competitions. Ajax have reached six European Cup/Champions League finals, winning four. Juventus have reached eight and won just two. The two clubs met in the 1973 European Cup final, with Ajax winning 1-0 in Belgrade. It was “total football” versus catenaccio, which made for a poor game. On paper, Ajax v Juventus is a classic European fixture, but the Italians will be favourites to win through. Juventus’s power and the inclusion of Cristiano Ronaldo means Ajax will be hard-pressed to produce another upset. The element of surprise may have gone as since Real were beaten, Ajax’s players have been under scrutiny and will, inevitably, be the target of bigger clubs – perhaps even Juve. However, Ajax have been in the ascendancy for a couple of years and let’s not forget they reached the Europa League final in 2017. Juventus’s older players, despite their obvious quality, will be tested by Ajax’s youth and vigour – five of their starting line-up against Atlètico Madrid were over 30 years of age, whereas Ajax’s team has an average age of barely 24. The tie should give us two compelling games.